The Mark Hofmann - Gordon B Hinckley twenty year reunion. Hinckley: "Mark, you dah MAN! Had you not sold me personally that Salamander Letter, that I wisely hid in the Vault, never again to see the light of day, our beloved Church would have been DOOMED!" Hinckley: Well Mark, I guess it is just you and me now that everyone else has resigned. Got any good ideas for starting a new religious movement? Hofmann: How about something with aliens, rocket ships, and big explosions? Hofmann: So whay did you spring me from Prison, Gordy? Hinckley: We need you Mark, my boy. We'd like you to forge the missing 116 pages for us, so we can "find" it, if ya catch my drift. You see, we want to explain those damn horses, elephants and such in a manner that makes sense. Those nitwits at FARMS are screwing it all up. Hinckley: Well, well! It finally happened! Gabriel blew his trumpet shaking the bars of the prison cell that held your buddy, something-or-other Lafferty. Hinckley: Right, right. And since Gabriel gave Lafferty magical priesthood powers which he used to destroy the U.S. government, proclaim himself Prophet, Priest, and King over the entire Earth under the guidance of Almighty Jehovah, and appoint you, his old crony, as Second Guy in Command, let's let bygones be bygones! Hofmann: Yeah. He bought me lunch! Hinckley: Yeah, he's such a great guy, isn't he?! Now I'm off to Outer Darkness. Lafferty just used his arm in a square to banish me there for all eternity. I see the folly of my ways. I was the leader of a church that damned itself because it misused its prophet's words and banished polygamy. Besides, he didn't like my tie. Oh, well. Hofmann: Hope it's good for ya. Since I have my own magical priesthood powers, with the additional eyes in the back of my head, nobody will call my works of art into question. Bombs be damned! I'll send them to Hell! Hinckley: That's the spirit! You show them all who's unqestionably right! Go ahead and wave to your new mindless flock. Wish we had the power to send dissenters to Outer Darkness when I was Prophet. Jesus told me that he kept that power for himself. Funny thing is Jesus keeps changing his mind. Whatever. Hofmann: Boy, there sure are a lot of people out there. My eyes are nearly popping out of my head just imagining the many ways I can screw with them! Hinckley: It's a trip! I'll tell you that! Sure takes the weight off of my shoulders. See you in Hell, Hofmann! Hinckley: I bet I've told bigger whoppers than you Brother Hofmann. Hinckley: Brother Hofmann, I see by the desperate expression on your face and by your frantic hand waving that you are choking and about to die. Not a problem for the Prophet of the Lord! Let me access the awesome power of the priesthood and slap you soundly on the back. THUNK! THUNK! THUNK! Hofmann: What is wanted? Why the hell did you hit me? Hinckley: Let this be a lesson to you, Brother Mark. I also choked and gasped for air myself one time back in 1947 when I got this hairbrained idea to actually tell the truth -- which immediately got caught in my throat and nearly cost me my life. Truth kills, you dummy! Not to mention it's very bad for business. Never tell the truth! Nobody actually wants to hear it anyway. Look where not telling the truth has gotten me? Hofmann: OK. I'm looking. Er ... um ... what was it I'm looking for here? Hofmann: Fooler?! Huh? Why, I'm the greatest forger and deceiver of all time! I ain't no mere "fooler." Hec, I pulled the wool over the eyes of a prophet of God! I even saw the vault, I...I should have asked for more money!! Damn! 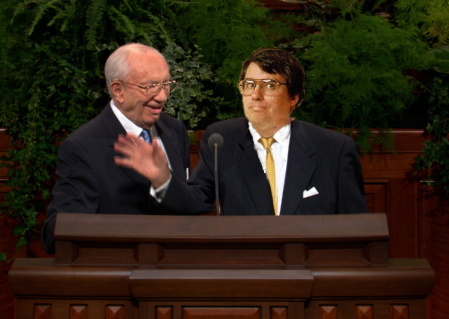 Hinckley: Brother Hoffman, here, has come up with some documents that prove I am not a corrupt bumbling half witted mormon weirdo.... uhhhhhhh ..... that prove... RrrrrRaaaaahackkkkk (Hinckley's patented gag/throat clear) I really am a great prophet! And THE Church is going to buy the documents! We are going to display them in our new Temple Square Mall! In a display case I had made from a tree cut from my own front yard....... We looked long and hard for this kind of documentation. RrrrrrrRaaaaaHack k k kk..... We couldn't find it anywhere else. But the Lord came through with Brother Hoffman! The Lord provided it! Its wonderful! Its a miracle! Isn't that right, Brother Hoffman! Hofmann: Whatever you say! President Hinckley... Profit, Seer and Revelator. Hinckley: I know some of you critics are concerned that this is the same Mark Hoffman that produced those forged documents years ago. Let me say: I don't know that we teach that! It is NOT doctrinal! Besides Brother Hoffman has a document, right here, that proves otherwise. Right, Brother Hoffman? Hofmann: Thats right, Profit Hinckley! Hinckley: Brother Hofmann, the Lord is profoundly grateful for your tax-deductible donation, your newest discovery found, the lost "Manuscript Found" which, unfortunately, is lost again. I had to return it to the Angel Solomon Spalding, when he appeared to me in the Holy-of-Holies on September 23 and asked for its return. Elder Hatch is making sure the I.R.S. will understand. The Lord and Angel Solomon have revealed to me that the lost "Manuscript Found" is a true history, as translated by Solomon Spalding, by the gift and power of God. This text was translated into English from an ancient record incised on tablets of clay, in reformed cuneiform, by the earliest ancestors of the Sumerians, the Ubaits, by the hand of Father Noah, himself! Solomon Spalding was led to the record's hiding place by a ghostly personage who, with great agility, was able to transform himself into a salamander. Angel Solomon revealed that Elohim have possession of the sacred clay tablets in Their Celestial Library. The terrestrial hiding place chosen for these tablets was a large, mysterious mound, shaped like a beehive, close to Solomon's Forge House at New Salem, Ohio. Angel Solomon stated that the largest, ancient, pre-Columbian population of this Continent had come to the Americas across Beringia, about 14,500 B.C., from Siberia. These Amersiberians, whose descendents became known as Lamanites, so-named after Father Lehi and Nephi arrived, stole the sacred, baked clay tablets from the Jaredites. They were so crafty in the arts of Master Mahon that they made themselves invisible to the Jaredites, who never knew the Amersiberians were always lurking about in surrounding forests and jungles. By the curse and mighty power of Satan, the Amersiberians erased from the minds of Jaredite scribes any record of this ancient text. (I thank the Lord for providing us with evidenciary proof to the truthfulness of the Book of Mormon through the science of DNA along with proof that American Indians descend from Siberia) The clay tablets revealed that the Lord had relocated Father Noah and his family with their world-class zoo, from Tell-Gumdropolis (that was formerly located at the rim of the Black Sea) to the southern end of the Fertile Crescent (which,in time, became Ur of the Chaldees), about 5600 B.C., not long after the Great Flood. The clay tablets also revealed how the ancient Amersiberians survived the Great Flood which had inundated the entire globe. Let me say that our finest minds at F.A.R.M.S. were blessed with just enough time to examine "Manuscript Found" and prayerfully determine that it had nothing to do with the Book of Mormon. That poor, deluded apostate, Doctor Hurlbut, had some kind of fertile crescent in his own mind. And those poor delirious "witnesses" living at Amity, Ohio in 1833, they were such an infidel lot. Satan works in mysterious ways. But wait, there is more. With enormous humility, it is my pleasure to announce that Angel Solomon promised me that he will return with the updated, inspired, translated version of Noah's account after the Angel Sidney Rigdon has had more time to make a few anachronistic scriptural updates regarding the Godhood, Blood Atonement, Polygamy, the true identity of God, Priesthood versus Blacks, updated Temple Ceremonies, and the truth about the Mountain Meadow Massacre. Once again the windows of Heaven are open to this chosen people. Soon we will be blessed with new, updated revelations and scripture, in another, new, modified version of "Manuscript Found", to be published as the "Book of Noah". Brother Hofmann, I hope you will accept your new calling as Church Historian. By the gift and power of God I testify the Church is true; that Jesus Christ lives and guides this church, in the name of Jesus Christ, Amen. Hofmann: My beloved Brothers and Sisters, in all honesty, I am proud to testify that the "Fool's cap" was found, by the gift and power of God, along with the help of a hobby knife that I found to be quite useful at the University of Utah Library--Old Documents Section. For a limited time only, you can order, on-line, your own "Fool's cap" at the reduced price of $29.95. Folded in the shape of a Jaredite submarine, and worn on your head cross-wise, you will strut quite smartly while dressed in your temple robes. You will bare testimony with astonishing confidence, persuasiveness and authority, with even greater obnoxious arrogance, which can be limited only by honesty, intelligence and common sense. Your very own "fool's cap" will protect you from any of these three evil influences. Remember, your thinking has already been done for you. Instructions are included. All major credit cards are accepted, at www.duped@lds.com. Hinckley: My dear Brothers and Sisters, I stand before you now humble in the fact that I am the tool of the Lord, a forger of truth! Hinckley: Hey Mark, I bet you feel stupid creating all those forgeries to try and discredit the church when all you had to do was some serious scholarship like Palmer and Southerton! Hinckley: If we can forgive John D. Lee for killing 120, then I see no problem with forgiving your for only two murders, both adults. Hinckley: pray you are not abusing yourself in prison. Hinckley: This Gospel is marvelous. We know that Brother Christensen and Sister Sheets are in the Celestial Kingdom now. Our Loving Heavenly Father had a plan for them and He needed them on the other side to continue this great work. Hofmann: The Lord works in mysterious ways. Hinckley: So, Mark, I understand you're here to admit forging those records of Joseph Smith's arrest for "glass looking." Hinckley: Hold to the rod my young brother Hofmann. Hinckley: Brother Hofmann, thanks for coming. The Lord needs someone like you to re-write our embarrassing Mormon history of Joseph Smith's sexual escapades, Brigham Young's polygamy and the Mountain Meadow Massacre and our lovely racist heritage towards Blacks and Native Americans. Hinckley: Brother Hofmann, welcome to General Conference. The Lord has forgiven you. Isn't this marvelous and wonderful. What miracle!